In the pages of Street Art, the reader will find thousands of unique, colorful, visually pleasing paintings by both known and unknown artists. Often times, these complex paintings appear on walls, billboards, trains, rock cliffs, under bridges, and on buses, with no one knowing who put them there. Some paintings may take up the entire side of a building, while others are just a small section of the object they are placed on. Loft Publications collected samples of graffiti and street art from all over the world, and created a large visual catalog with an illustrative selection of diverse talent that floods today’s streets. The artwork can be found in cities including, but not limited to, New York, Los Angeles, Tokyo, London, and Paris. Street Art contains sections on 3-D, wild style, tags, stencils, and stickers giving the reader an overview of the various types of artwork that appear throughout urban landscapes in the second decade of the twenty-first century. Street Art loosely classifies the artwork into three chapters: letters and tags, pieces, and street art. Each includes a brief overview on the artwork in each chapter. “Letters and Tags” includes a wide variety of figurative and abstract typography. These tags are often signatures of the graffiti artist. Some of the tags are almost unreadable, hiding in the shapes and colors they are made of. Others are crisp and three-dimensional or bubbly looking. Some of these tags include symbols, cartoon animals, and popular cartoon characters such as Mickey Mouse, Goofy, Donald Duck, Captain America, Spiderman, Wolverine, Mr. Burns, Mario, and Luigi. Many are so complex, it makes you wonder how someone can visualize and create something so flawless while secretly painting at night with cans of colorful spray paint. The second chapter, “Pieces,” includes the evolution of artwork after various sizes of spray paint nozzles were developed. This allowed artists to create thicker and thinner lines, which is no longer restricted their artwork to letters and simple designs. In this section there are a number of works portraying popular culture, which contains symbols, portraits, landscapes, cityscapes, and material items. Many of these paintings are highly detailed and realistic. Also included in this chapter are many large-scale murals that were less likely to be seen in previous decades. 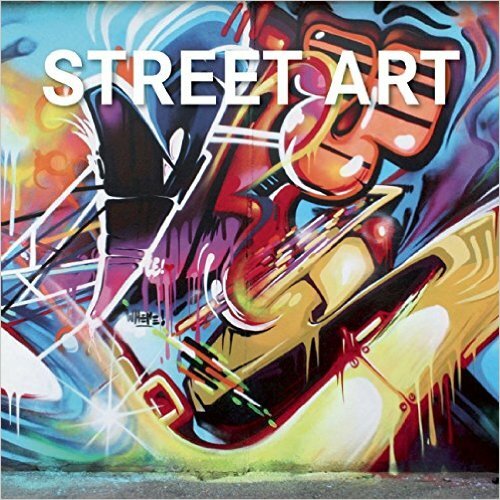 The final chapter, “Street Art,” is a collection of works that portray many of the latest trends of graffiti art. The artworks include the use of stencils, which allow the same symbol to be repeated as many times as the artist would like, in a variety of places. In addition, there are stickers which let the artists put their paintings on street poles and other places that weren’t previously possible. Some artists use canvas, which lets the artwork be transferred to a gallery instead of being washed away. Understandably, there is not much information about these works of art. Throughout the book, there is a URL above each image which links to where the images were found online and possibly the name of the piece and whoever posted the photo. Loft Publications stated that these works were from cities around the world. By viewing some of them, I could tell that they are; however, the city of origin was not listed for any of the artwork in the book. Some may argue that the lack of information leaves these paintings more open to interpretation, but knowing the place and/or date of where each photo was taken could allow the viewer to better interpret the paintings, especially the ones that include messages from political movements. This book is a great source for artists, designers, and typographers to look to find a variety of styles of artwork for inspiration. Anyone who doesn’t know much about art but likes viewing it will also greatly appreciate this book. The artwork in this book will blow you away if you go into it open minded, and not with the mindset that these artists vandalized the streets in city of which they are found. The content of its pages is unique and eye opening for someone who doesn’t realize how big street art is throughout the world. About the author of this post: Katie Connors is a senior at North Central College. She is pursuing a degree in Interactive Media Studies: Graphic Arts. Other interests of hers include drawing, painting, hiking in pretty places, and learning about wildlife.